NEW: Safe Room / Vault Door Combination. 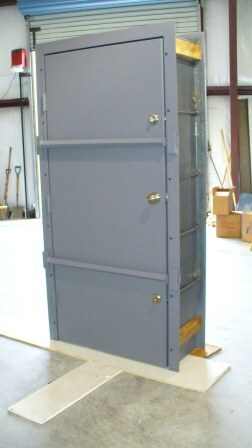 This is a new door and locking system we designed for personal security and gun room applications. It functions as a regular door by using the keypad on the lower right of the door. The keys are lighted keys when the first button is pushed. Door has a passage function on the passage lock which allows you to enter without having to use the keypad (simple turn of a knob located on the inside of the door lock). Or it can be automatically locked each time you close it. 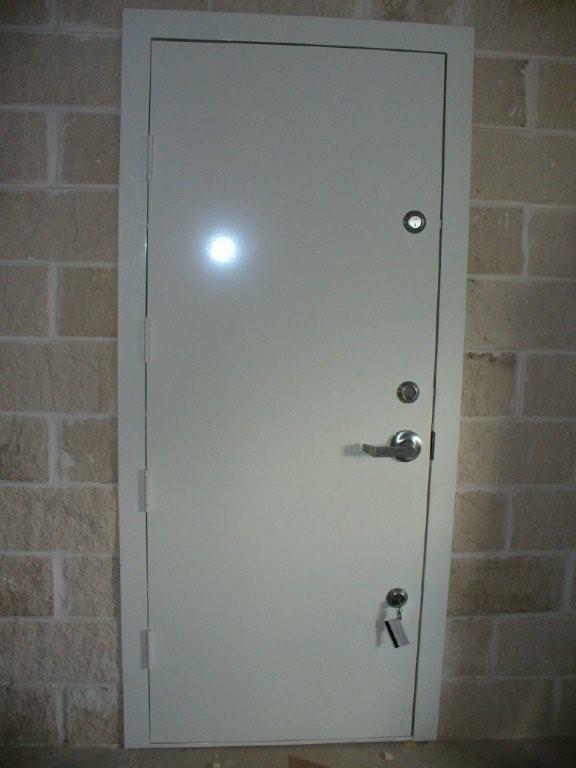 Vault door function: 18 bolts of one inch steel on the side of the door allows for the door to be locked with the handle located on the middle of the door below the combination lock. Combination locks are difficult to pic and are used in many vault and safe applications. Located on the inside of the door is a release handle which bypasses the vault door locking mechanism so no one can ever get locked in. Can function as a safe room during severe weather. Summary: The passage handle on the right is used while at home, advantages are quick entry (also has a keyed backup if ever the electronics fail) Combination lock / vault door locking is used when away from home and very secure utilizing the bolts. 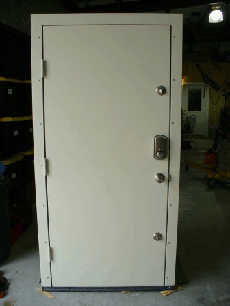 Door sits on three heavy duty ball bearing hinges. 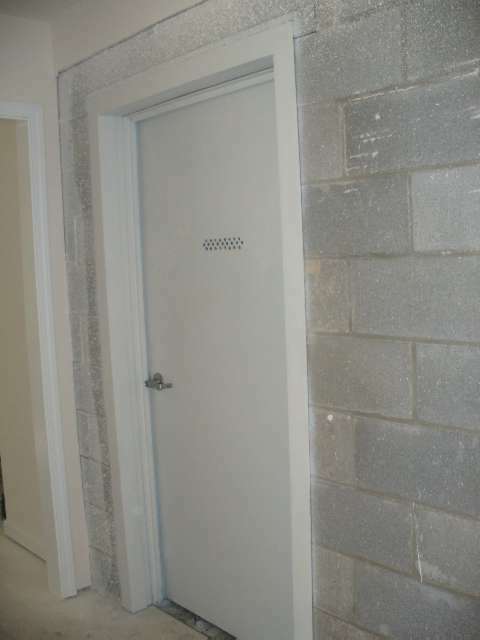 Safe rooms may be built out of Armor plate for resistance against high caliber projectiles. 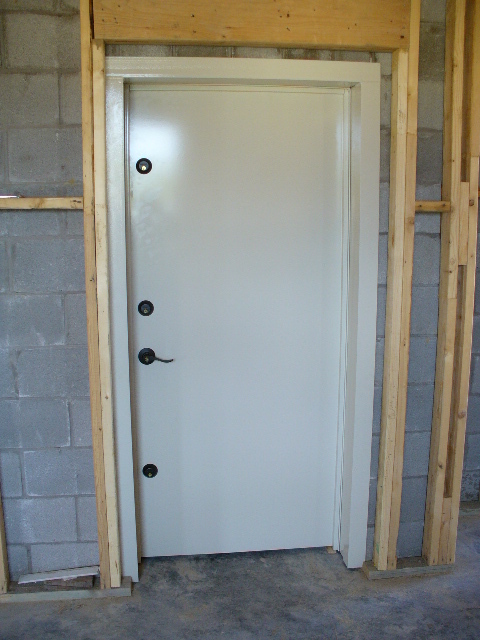 We can also build specialized bullet resistant doors for different applications. Even automated ones with battery backup. 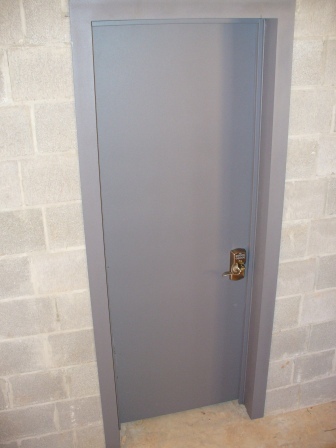 Rhinovault safe room doors for extreme wind events like tornado and hurricanes provide high security protection for use in safe rooms, gun vaults, hidden rooms, computer rooms and other applications. 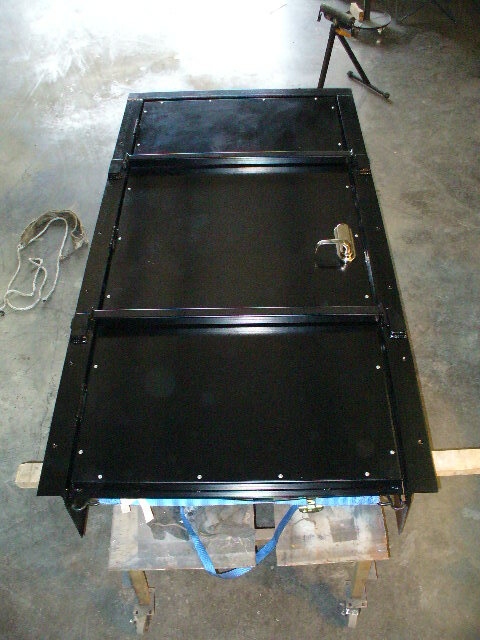 Our secure doors are built as a heavy duty 2 part frame, we can place the safe room door and inner frame into opening, level and true the door, then pull together the two assembies by tightening the "high strength bolts which are located on the inner door frame assembly.This compresses the frame into place and secures door for long lasting security and protection. Additional bolts maybe secured into the wall itself through the frame, but are not required. Spacers may be installed between frame and wall during assembly to allow finishing work, panelling, drywall, etc., Spacers between frame and wall will allow 1/2" or so gap between frame and wall to provide space for drywall or paneling. 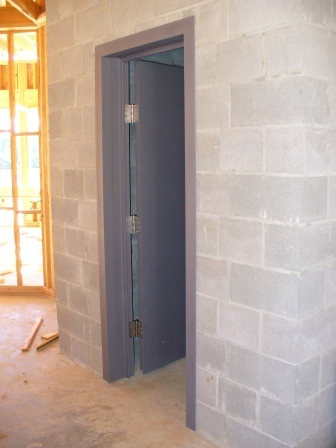 Fema 320 and 361 safe room door frames may also be bolted directly into a concrete wall if desired. We will design according to the needs of the builder or homeowner. 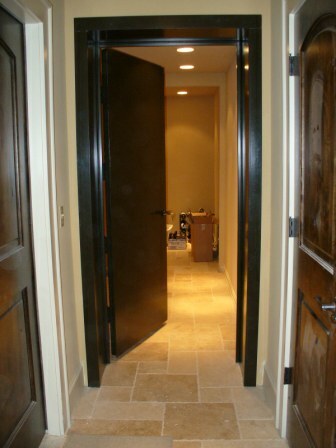 Each frame is engineered to the size and weight of each door. 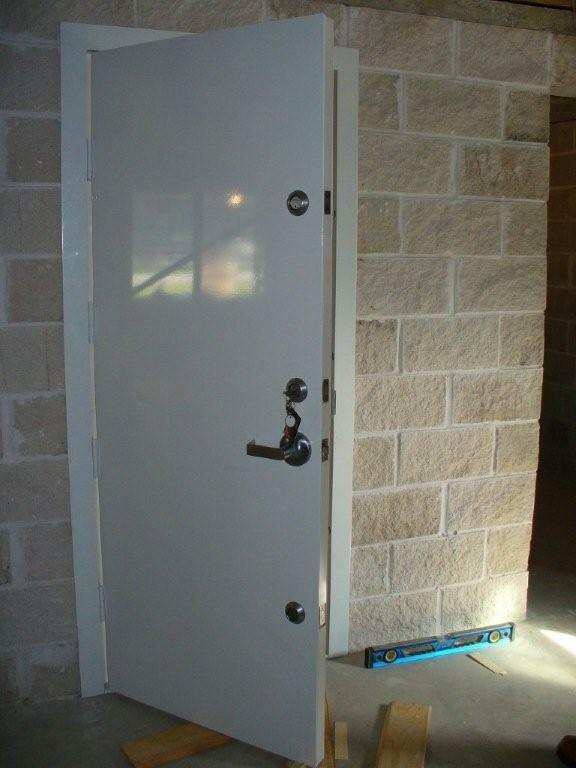 Safe room doors may also be fitted with protected venting for security structures that may have restricted air flow within the vault. 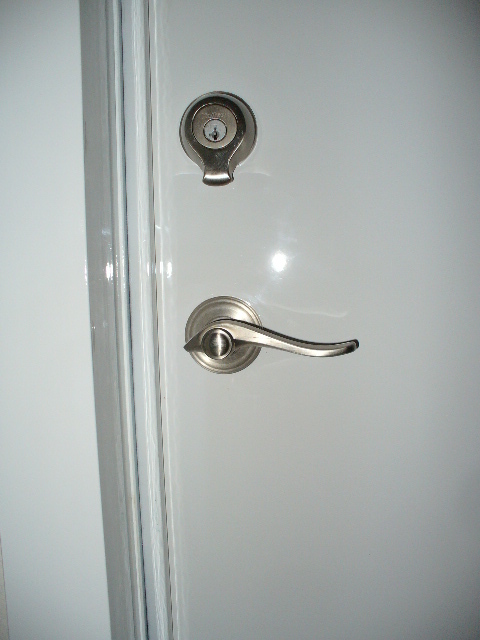 Several locking systems are available for each door. Electronic, keyed entry, combination, magnalocks, keyless, proximity, or even biometric capable systems. Standard doors are equipped with a commercial grade key locking handle and one lock. 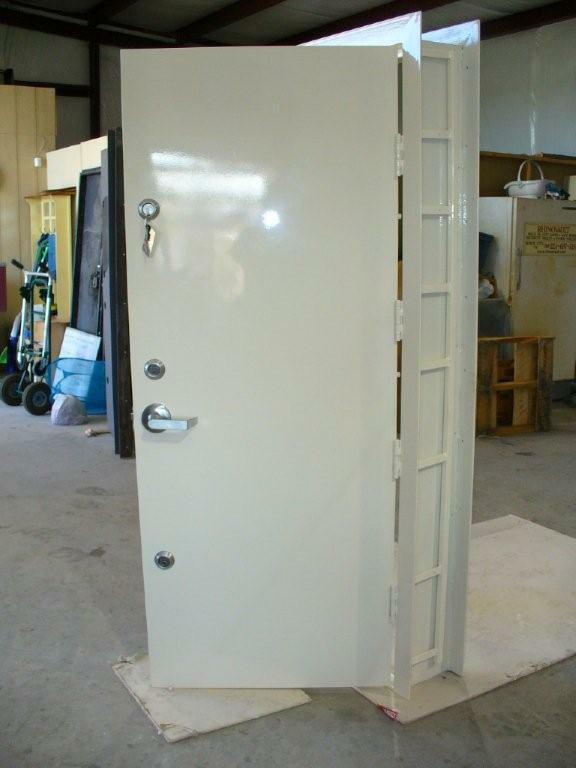 If your are a handyman, you can build your own fema 320 door. 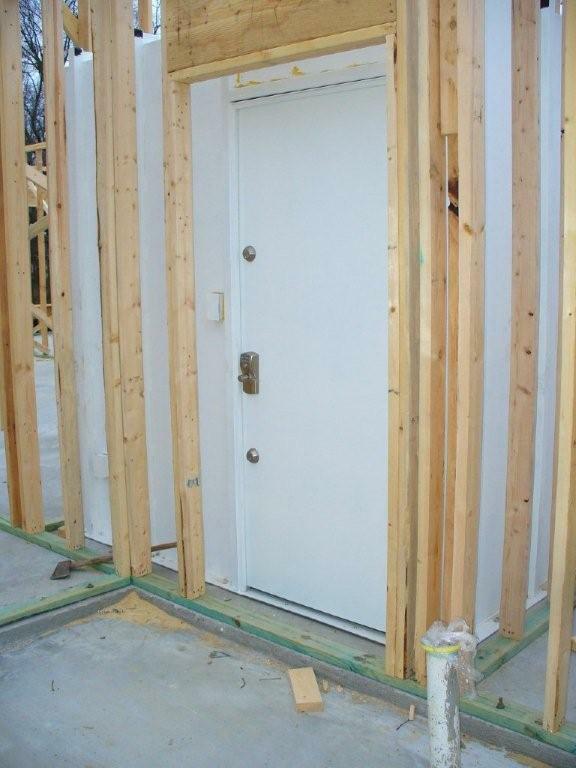 Our Ballistic rated doors may use MIL-A 46100 or Waco Composite Fiberglass. This specification covers high-hardness armor plate that is approved for use within the Department of the Army and is available for use by all Departments and Agencies of the Department of Defense. Applications are various. Surface hardness of this material is between 477 and 534 brinell. MIL-A 12560 This specification covers armor plate that is approved by the Material Technology Laboratory, Department of the Army. It is approved for use in combat-vehicles and for ammunition testing. Thickness ranges from 1/4” through 6” inclusive are for use in combat-vehicles and 1/4” through 12” inclusive are for use in proof acceptance testing of armor defeating ammunition. 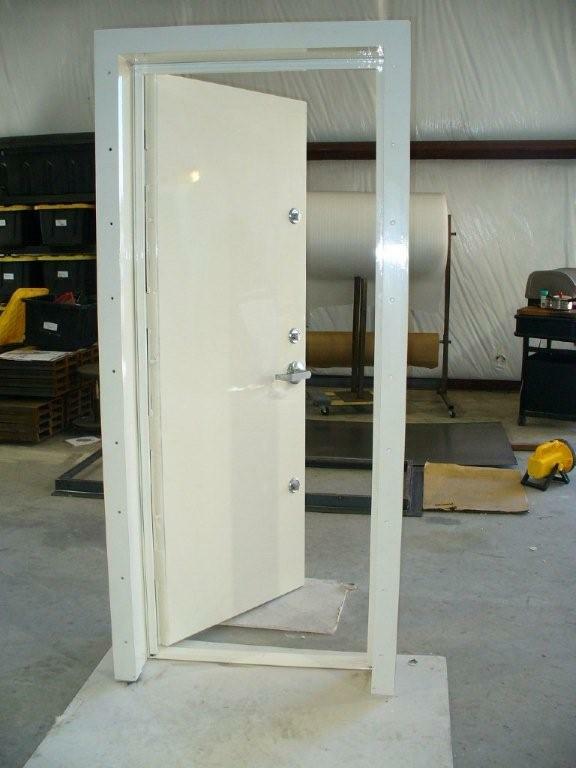 Our safe room doors may designed and engineered to be specifically used as protection against small arms and forced entry and far exceed minimum requirements for a FEMA 320 and FEMA 361 safe room doors. 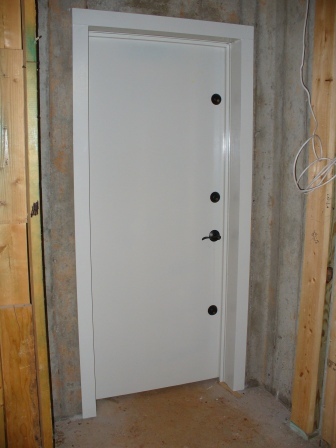 Our safe room doors may easily installed into an existing 4" to 18" thick wall opening and are built to any size opening. If used for personal security against guns, we can add UL 752 rated panels or ballistic rated steel to the assembly. From 44mag to AK47. 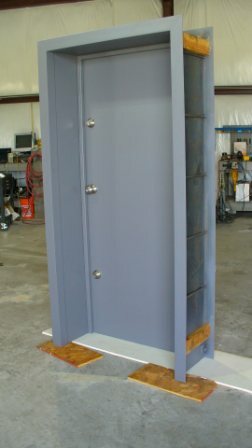 Face may use 1/8" A36 steel plate or 1/4"steel plate with 5 horizontal and 2 vertical 1-1/2"
Powder Coated or Painted to color. 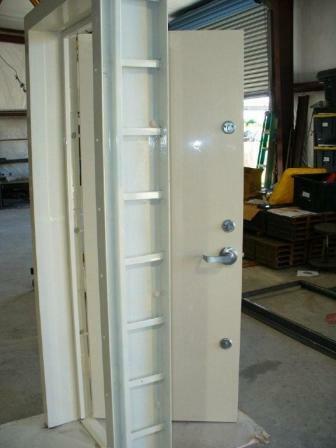 Basic Safe Room Doors are equipped with three locking points or three deadbolts keyed alike. Door may be opened from the inside of the shelters without keys.